If you're trying to stretch a buck in today's economy, I've got the dish for you! I actually think this might be one of my new personal favorites. The ingredients are so simple, but combining them creates something you'd never expect! It's soooo good. This dish is really quick and only uses a few wallet-friendly ingredients. 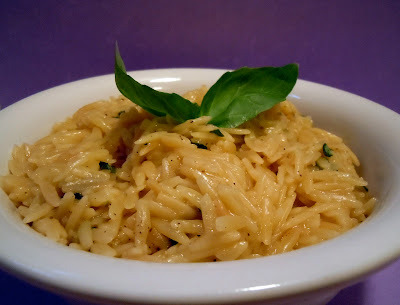 If you've never had orzo, it's a small rice-shaped pasta that is usually prepared similarly to how you would prepare risotto. What's great about it is that it's cooked in chicken broth, so the pasta absorbs this great flavor and adds a whole other level of tastiness to the dish. My only recommendation is to use fresh Parmesan cheese if you can. In can be pre-grated, but make sure it is fresh and not the powdery stuff you find in the pasta aisle of your grocery store. It really adds to the texture of the pasta and makes it extra creamy. Try this tonight! Seriously! Heat butter in saucepan over medium heat. Add orzo and cook 3 minutes, stirring constantly. Stir in broth and water; bring to a boil. Reduce heat and simmer until liquid is absorbed and orzo is done (about 15 minutes). Remove from heat. Stir in cheese, basil, salt and pepper. Serve immediately.